It's not easy to make a movie about a writer. What do they do, except sit in front of a typewriter and think, type and worry? 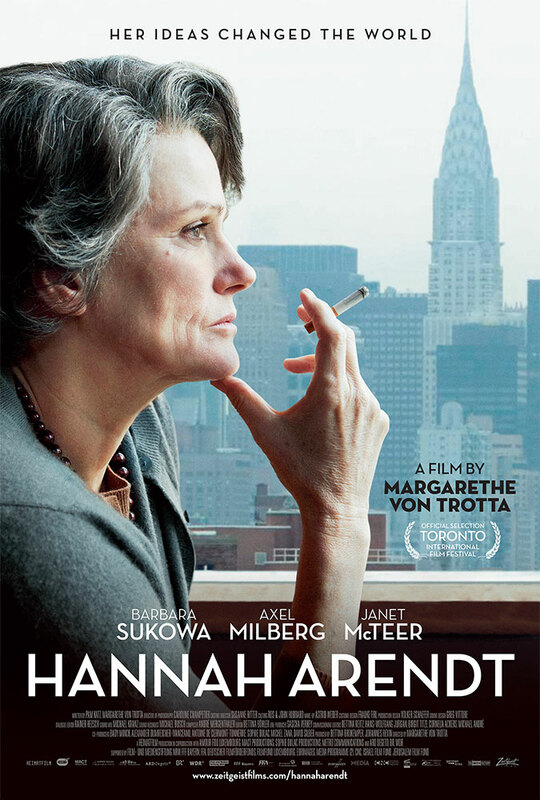 So imagine you're director Margarethe von Trotta, and your subject is Hannah Arendt, the German-Jewish writer, philosopher and political theorist best known for the term “the banality of evil.” Writing, philosophizing and theorizing, three of the least visually dynamic activities on earth. One solution: have your subject smoke. A lot. 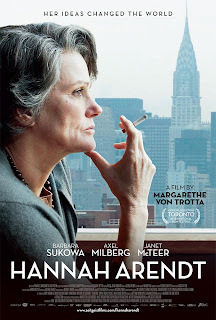 So many cigarettes are consumed during HANNAH ARENDT, I wouldn't be surprised if the film's crew got cancer. Smoky as it is, the film brings renewed attention to Arendt, who wrote extensively about the nature of power and totalitarianism and whose coverage of the 1961 Adolf Eichmann trial in Jerusalem aroused considerable controversy that is still unsettled. Arendt is best remembered for inventing the term “the banality of evil,” by which she tried to reconcile the seemingly ordinary-seeming demeanor of Eichmann, the high-ranking Nazi official responsible for sending millions Jews to their deaths, with the epic monstrousness of his deeds. Like the Nazis tried before him after the war, Eichmann employed the so-called “Nuremberg defense” — that he was just “following orders.” Other testimony and writings contradicted this, painting Eichmann as no mere bureaucrat, but a deeply committed Nazi ideologue and Hitler devotee who admitted he would have had his own father murdered if required to do so. After cartons of cigarettes are smoked by Arendt and the anxiously waiting New Yorker staff, the first of Arendt's Eichmann articles is published in the magazine. Then, all hell breaks lose. Arendt loses beloved longtime friends, except for her loyal pal, the novelist Mary McCarthy (played by the always interesting Janet McTeer). She gets hate mail and death threats and is asked to resign her teaching position. Numerous readers were outraged, believing that Arendt, by writing that Eichmann was “terribly and terrifyingly normal,” was excusing Eichmann and other war criminals. Jewish readers were also infuriated by her sharp criticism of European Jewish leaders, like M.C. Rumkowski, who collaborated with the Nazis. Although Arendt was Jewish, had been interned in the Gurs prison camp, and later worked to save the lives of German Jewish children, she was vilified as a “self-hating Jew” and accused of blaming the Jews for their own fate. Arendt's articles were later published as a book, Eichmann in Jerusalem: A Report on the Banality of Evil. Arendt's reputation was already problematic because of her long, tumultuous relationship with philosopher Martin Heidegger, her academic mentor and lover, who became a supporter of the Nazi party. In flashback sequences, Hannah reflects on her youthful dalliance with Heidegger (Klaus Pohl), and her subsequent disappointment with his capitulation. This is a movie about ideas, which are difficult to dramatize; therefore, we get a lot of scenes of smoke-filled conversation and classroom lectures. The dialogue and characterizations are often rudimentary. The Eichmann trial is the most arresting sequence, because it incorporates real documentary footage of Eichmann's testimony from inside the famous “glass booth.” As we see and hear the chilling testimony of Holocaust survivors and watch Eichmann attempt to justify his actions, we can see why Arendt was so struck by the man's icy calm, and whence she derived the concept of evil as something ordinary people are capable of. At the time, many postwar academics were attempting to explain the Nazi phenomenon, a coldly modern, bureaucratic expression of evil. Arendt's writings inspired, for example, the infamous experiments by Yale psychologist Stanley Milgram, in which subjects complied with instructions to administer to fellow students what they believed were potentially lethal electric shocks. Later writings about Eichmann, based on his unpublished memoir and previously unreleased interviews, take issue with Arendt's conclusions about Eichmann — “he was no clerk,” wrote historian Deborah E. Lipstadt. But in fact, as a recent New York Times article pointed out, Arendt never wrote that Eichmann simply followed orders. Rather, she wrote that he was a “joiner,” a man for whom idealism and devotion to a cause –—Nazism — gave his life meaning. Even with its dramatic shortcomings, the film shines a welcome light on a rigorous, and often misunderstood, 20th-century thinker. 2 3/4 out of 4 stars.